While the new 2015 Volkswagen Golf looks very similar to last year’s Golf, which looked much like the Golf before it, this latest version is an all-new design riding on an all-new platform shared with the Audi A3. 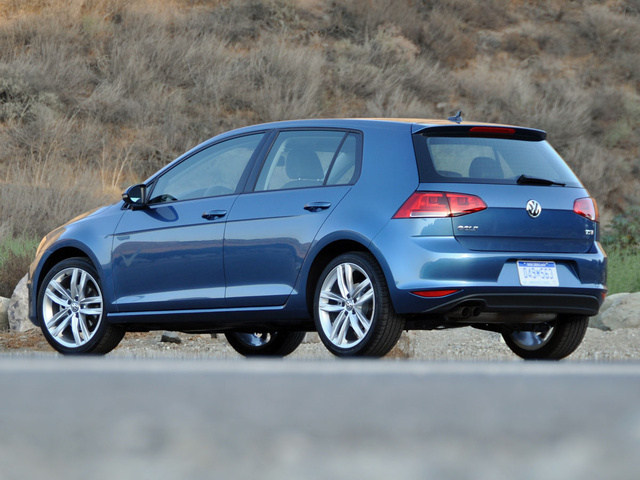 The Volkswagen Golf practically defines the hatchback, and the latest version is no exception. With a refined interior and an engaging, let’s-take-the-back-road driving demeanor, the new Golf is a fun yet practical little car. Don’t expect it to be cheap, though, especially if you want modern creature comforts. It’s funny how the mind gets stuck in a certain period in your past, and how everything in modern life becomes relative to it. For some, it’s the price of a gallon of milk or gasoline, or a movie ticket. For me, it’s the price of a small car. Perhaps it’s because the late 1980s represent the era when my friends were first starting to get cars, but I can’t help but continue to assume that an entry-level vehicle can be had for about $10,000. While it’s true that a 2015 Nissan Versa with no extras comes close to that price, most small cars today wear a window sticker twice that amount. And despite inflation and a three-decade march of progress, a little shock still goes through my system when I see the starting price of a new Honda Civic. With that as background, you can imagine how I found the sticker price of the all-new, seventh-generation, 2015 Volkswagen Golf sitting in my driveway to be utterly staggering. It came out to almost $29,000. Yes, we’re talking about the top-of-the-line SEL model with options, but yikes, that’s a steep price for a small car. Good thing the base price of a Golf starts under $18,000… technically. You might have trouble finding one, as the Golf Launch Edition enjoyed a short-lived, very limited release. A 2-door model with a manual transmission, the de-contented Launch Edition’s sole reason for existence was to help people like me get over sticker shock. Step up to the Golf S, abundant on dealership lots and serving as the real point of entry to the lineup, and you’ll have a choice of 2-door or 4-door body styles. You’ll also get alloy wheels, leatherette upholstery and VW's Car-Net emergency telematics system. An automatic transmission and a power panoramic sunroof are options. Next up is the Golf SE, available only as a 4-door with an automatic transmission. This version of the Golf rides on bigger 17-inch alloy wheels and includes fog lights, heated front seats, a rear-view camera, rain-sensing wipers and a 9-speaker Fender premium audio system. A Golf Sport is based on the SE, a limited-edition version equipping the car with a body kit and rear hatch spoiler for a racy look. A Lighting package adds bi-Xenon headlights, LED daytime running lights and active headlights that pivot as you steer to help the driver see around dark corners. The Golf SEL trim adds 18-inch alloy wheels, keyless access with push-button engine start, sport comfort front seat designs, a 12-way power-adjustable driver’s seat including power lumbar support, ambient cabin lighting, dual-zone automatic climate control and a navigation system. Options for this version include the Lighting package and an exclusive Driver Assistance package providing front and rear parking sensors along with a forward collision warning system. My test car is the top-of-the-line Golf 1.8T SEL 4-door with the optional Lighting package, priced at $28,810. While this new Golf looks very similar to last year’s Golf, which looked much like the Golf before it, the 2015 model is an all-new design riding on an all-new platform shared with the Audi A3. Everything’s been tidied up inside and out, with tauter lines and sharper creases on the exterior combined with higher levels of refinement and improved controls on the interior. Visually, the 2015 Volkswagen Golf might appear to be evolutionary, but under its skin this is revolutionary in many ways. If you’re disinterested in the standard Golf’s turbocharged 4-cylinder engine, Volkswagen offers a bunch of other choices. 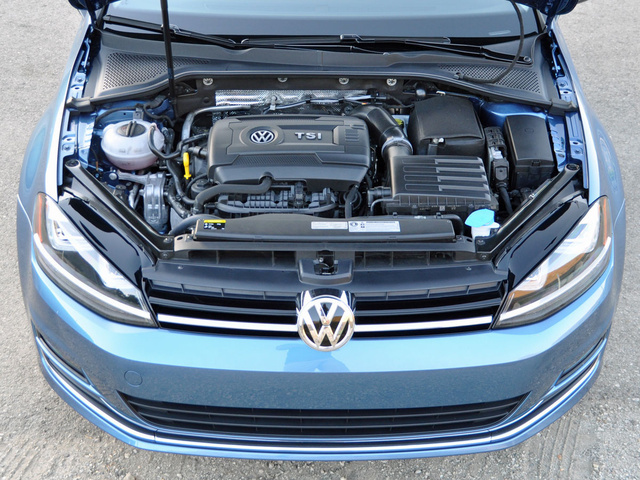 You can select the Golf TDI for its thrifty turbodiesel engine. An electric e-Golf model is new to the lineup this year, providing gas-free mobility. For the driving enthusiast, the Golf GTI is better than ever, and a racy Golf R is also joining the lineup soon, complete with all-wheel drive and greater performance capability than any Golf to precede it. 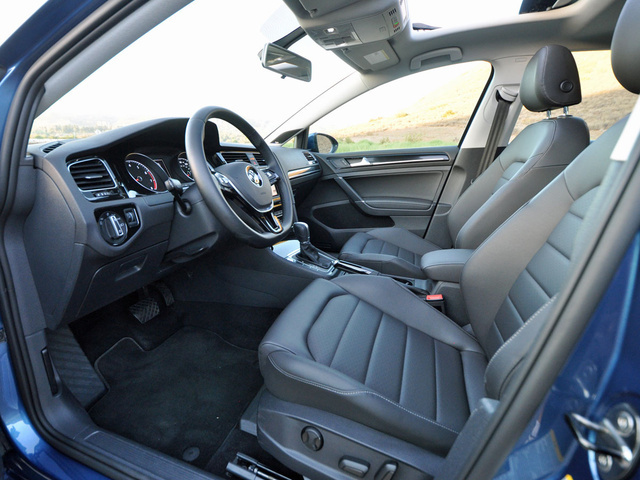 This review, however, focuses on the Golf 1.8T. Volkswagen infuses the Golf 1.8T with a turbocharged, direct-injected, 1.8-liter 4-cylinder engine making 170 hp and 200 lb-ft of torque, a delightful little powerplant that delivers seamless power across the rev range. In almost every situation the Golf hopped and skipped lightheartedly, and while acceleration wouldn’t be called thrilling, the engine’s supple power delivery always brought a grin to my face. The very slight lag when launching the car from a stop may be noticeable to someone who has never experienced a turbocharged engine, but in my opinion it has negligible impact on overall driving satisfaction. Thankfully Volkswagen decided against putting its Direct Shift Gearbox (DSG) in the Golf, an automated manual gearbox that I find quite dissatisfying. Every experience I’ve had with VW’s DSG has been fraught with teeth-gnashing frustration. Instead, the Golf 1.8T gets a traditional 6-speed automatic transmission delivering the power to the front wheels, and providing nice, crisp shifts whether you’re in Drive, Sport or manual mode. In my week of driving, I averaged 26.2 miles per gallon, lower than the EPA’s 29 mpg rating for combined driving. Still, during a leisurely highway stroll, the Golf was averaging 35.6 mpg according to its trip computer. What’s even better, the Golf does not require premium fuel, a refreshing change from most turbocharged engines. And like most turbocharged engines, this one gives the Golf satisfying zero-to-60 acceleration times of under 8 seconds, according to testing by independent publications. The rest of the driving experience complements the drivetrain. Over the occasionally imperfect roads of my local metropolis, the suspension soaked up disturbances and merely transmitted their existence to the driver through the steering wheel. The steering, by the way, highlights the Golf’s tight turning circle, neatly pirouetting the VW into tight parking spots with grace. On the curvy sections of my test loop the Golf did not disappoint, showing a puppy-like playfulness while being tossed into hairpin corners, eagerly bounding out and ready to chew into the next decreasing radius turn. The SEL trim’s 18-inch tires are nice and sticky, and the brakes showed no fade under duress, despite warm testing temperatures. While true enthusiasts might prefer the more aggressively tuned Golf GTI, I found the Golf 1.8T SEL to be plenty entertaining. It’s right up there with other fun-to-drive hatchbacks that handle beautifully, such as the Mazda3 and Ford Focus. As of late, some Volkswagens have fallen victim to the company’s bean counters. While it used to be true that VWs, even the cheaper ones, were dressed in fancier clothing compared to their direct competitors, recent Jettas and Passats have more in common with that infernal Macklemore song about discount retailing. I’m glad to report that the Golf has broken ranks and is suitably better outfitted. Everywhere you look and touch within the cabin there are soft, substantial materials, and surfaces like the center console and the window ledge, where many drivers rest their elbows, have padding to aid comfort. All the switchgear and buttons also feel like they’ve been assembled with care. My test vehicle’s front sport comfort seats proved supremely supportive, and the perforated leatherette felt as soft as real cowhide. Certainly, the SEL’s standard 12-way adjustable power driver’s seat went a long way toward making this version of the Golf feel a long way from the penalty-box econo-hatches of the past. 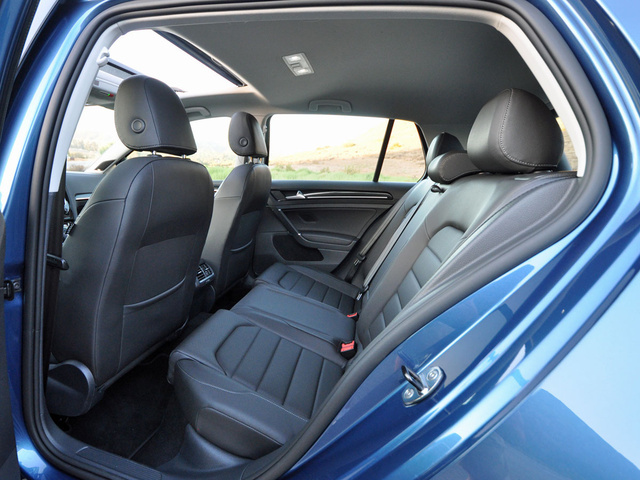 As might be expected, the Golf’s rear seat is a bit tight, even as modern compact cars go. That said, space is decent for adults, and I carried kids with no trouble at all, though by the number of footprints all over the front seatbacks, it's clear that my offspring also found the quarters confining. Still, hatchbacks give you greater flexibility to carry cargo. The Golf provides 13.7 cubic feet of luggage space beneath the parcel shelf, and 22.8 if you stuff every nook and cranny from the spare tire to the roof. Fold the 60/40-split rear seats (with cargo pass-thru) and you’ll have 52.7 cubic feet of room at your disposal. Every 2015 Golf includes a 5.8-inch color touchscreen infotainment system that serves all your information and entertainment needs. Point your finger close to it and the proximity sensor automatically expands the menu, a neat little trick that saves on-screen real estate and makes it easier to find what you need. The screen also allows you to swipe, scroll and even pinch or expand information with your fingertips, much like today’s smartphones. In addition to standard Bluetooth connectivity with music streaming capability, a standard Media Device Interface allows you to sync your phone to the infotainment system to make it easier to access music. Whether you’re listening to satellite radio, HD Radio, Internet radio or your own music library, the available Fender premium audio system pumps out unexpectedly gorgeous notes. My Golf SEL’s navigation system was easy to set up and use, but curiously, traffic information was not integrated with the map. Instead, information about traffic delays is provided on a different screen within the system, and this is not an ideal approach. Every 2015 Golf includes a feature called an Automatic Post-Collision Braking System that applies the brakes after you’ve been in a crash so the car stops moving, thereby reducing the chance of secondary impacts with other vehicles. Car-Net connected services is standard for all models but the Launch Edition and includes a free trial period. If you like Car-Net, a subscription is required for service beyond that. With an active Car-Net subscription, the Golf features an SOS emergency button and an Automatic Collision Notification feature. Once connected to your smartphone, it’ll also help you find your car with the Last Parked Location feature, while the Family Guardian feature alerts you when the Golf exceeds a certain speed or travels beyond a set boundary. Depending on which trim level you choose, other active safety systems are available for the Golf, such as a reversing camera and rain-sensing wipers, but if you want front and rear parking sensors and a forward-collision warning system, you’ll have to first buy the high-shelf SEL trim level. 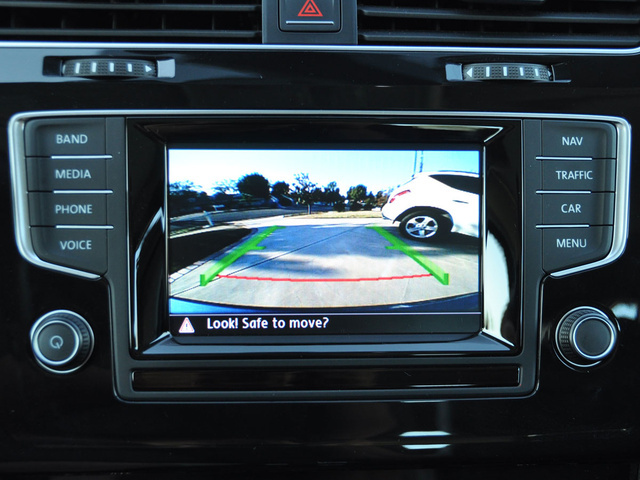 A blind-spot monitoring system is not available for the Golf, a misstep that will hopefully be fixed soon. If you do happen to get into an accident, know that the Insurance Institute for Highway Safety (IIHS) gives the 2015 Golf a Top Safety Pick rating. Let’s talk about sticker shock one more time. My Golf SEL test car was not cheap. But a loaded Ford Focus Titanium and Kia Forte5 SX are in the same neighborhood, and you can load a Mazda3 s Grand Touring up to nearly $32,000 (choke). Viewed from this perspective, and given the Golf SEL’s impressive fit and finish, the price isn’t necessarily out of line, though the car lacks leather and the same level of safety technology found on those competing models. Plus, VW regularly offers low-rate, long-term financing and leasing deals on its models, making the Golf even more appealing. Unfortunately, for the 2015 model year, Volkswagen has reduced its value equation by chopping its free Carefree Maintenance program down to 1 year or 10,000 miles of scheduled service visits. That’s essentially worthless, and is a big change from 2 years ago, when this program actually did make a Golf owner’s life carefree thanks to 3 years or 36,000 miles of coverage. This continued reduction in perceived value and corporate confidence in the product is premature. J.D. Power surveys show the Golf to be firmly stuck at what translates to mediocre when it comes to quality and dependability, though Consumer Reports puts a happier face on the reliability front. Plus, ALG expects the Golf to retain its value at an average rate over time. As far as fuel economy is concerned, my Golf netted an average of 26.2 mpg, less than the EPA-stated 29 mpg. Still, that’s a pretty good number, especially considering how energetically I drove the car most of the time I had it, and I definitely appreciated the fact that the Golf 1.8T does not require premium fuel. Still, if you want to maximize fuel economy, you need to choose the more expensive Golf TDI model. From a practical perspective, the 2015 Golf still doesn’t make a strong argument for purchase, but I had so much fun driving this comfortable and cargo-capable car that I’d be willing to overlook some of these more unimpressive attributes. 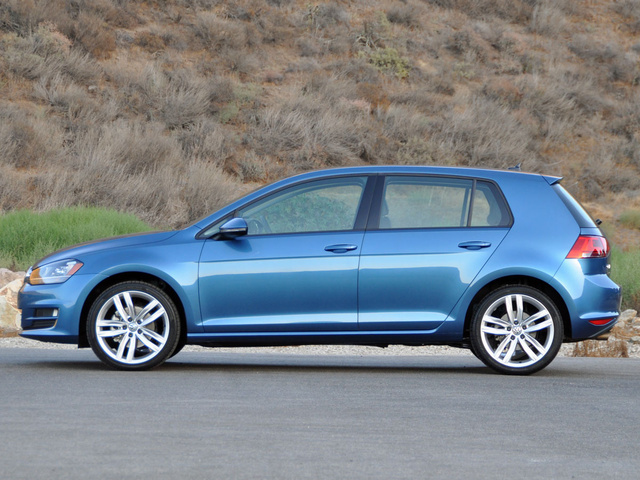 What's your take on the 2015 Volkswagen Golf? Fredjgeiger Too bad that VW has apparently decided to not release the Golf plug in hybrid to the .u.s market? It is already availablei in .europe. I for one will not pay a $10 K premium to get this drive train in the Audi A3 ,which is the only available choice here. Dow Vw REALLY want to gain market share here? If so why are we ALWAYS month / years late in getting the good stuff? Sandy My wife got the new Audi A3 and it really is a great vehicle but I had no intention of paying that much for a new vehicle since I had bought one last December. But I wanted something as fun as the A3 and found the Golf SE to be just the right choice for me and that it runs on regular was just the icing on the cake. Am glad I got the blue over beige SE model and since I didn't care for the standard 17" alloys, we swapped out the 17" ones from the TDI model which makes mine look just perfect! I am a happy camper and love my 2015 Golf SE. And just found out that my vin is not included in the recall in the news today. What's not to like!!! 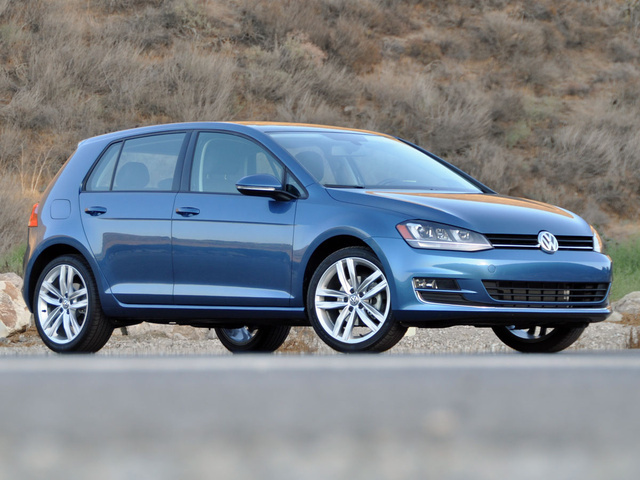 Users ranked 2015 Volkswagen Golf against other cars which they drove/owned. Each ranking was based on 9 categories. Here is the summary of top rankings. Have you driven a 2015 Volkswagen Golf? On the inside, there's a little knob on the hatch, when twisted, it falls out, what is it??? ?